Pet doors are great tools for giving small pets the freedom to roam around an owner’s property without inconveniencing the owner. Pet doors can also serve as sources of egress and resulting injury for young children, however. Children small enough to fit within pet doors may crawl through them to the outside, thereby gaining access to roads and pools without their parents’ knowledge. If your child has been injured in a pet-door-related accident, you may be entitled to compensation from the manufacturer or a negligent supervisor. Call child pet-door-accident lawyer Jeffrey Killino at 877-875-2927 to learn more about your legal rights. Pet access doors may be larger than they appear. 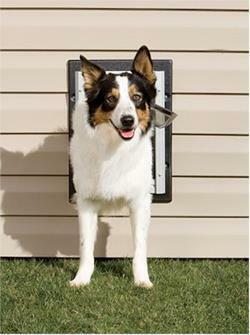 The average doggie door is 8 x 10 inches, smaller than a sheet of standard printer paper. These doors are targeted specifically at pets with weights of 40 pounds or less and are made large enough that such pets will comfortably fit through their openings. Small children are often of a size and weight to easily pass through a pet access door. The average America 3-year-old weighs approximately 38 pounds – less than the maximum recommended weight for most pet entryways. Once outside the house and unsupervised, children who pass through these doors are put at risk of drowning, becoming lost, falling down stairs, wandering into roads, or sustaining serious injuries from any number of additional hazards. Drowning is the second leading cause of death of children between the ages of 1 and 4. Pet doors are contributors to the frequency of this occurrence. Most children who suffer injury or death after leaving a home through a dog or cat access door do so by falling into a water source and drowning. Safety Research & Strategies, which compiles its statistics from several sources including the Consumer Product Safety Commission (CPSC), has reported that fatal and non-fatal drownings account for a large percentage of pet-door-related injuries. Pet-door manufacturers could greatly reduce the number of child-injury cases associated with their products through the inexpensive and easy attachment of a warning label on these doors, alerting owners and family members of the dangers associated with the product. Such warnings would allow parents to take the precautions necessary to prevent their children from exiting the home through an unguarded pet door. Though some manufacturers have included such warnings, many have declined to add this step to their production process. Pet-door owners whose children have been injured or killed after exiting a home through a pet door have brought product-liability actions against the manufacturers of these doors under a failure-to-warn theory. Many of these doors do not contain warnings alerting parents that children can fit through the doors. Product-liability actions may be brought against the manufacturers of defective products or anyone else in the chain of the product’s distribution if the defect is found to have been a cause of the plaintiff’s injury. Defects that can result in liability include defects in manufacture, defects in design, and defects that result from a failure to warn. When a product is designed and manufactured in a safe and non-defective manner but can nevertheless be dangerous under certain conditions, manufacturers have a duty to warn consumers of these dangers and to provide instructions necessary to use or operate a product in the safest possible manner. Thus, a product-liability claim under a failure-to-warn theory may allege that the product was made unreasonably safe by the manufacturer’s failure to provide adequate warnings about dangers associated with the product that could be avoided, or to provide instructions for keeping the product safe for use. Pet doors are often equipped with locking mechanisms that can be employed when small children are nearby. If a manufacturer fails to warn of the possibility that such children will exit the home through an unlocked door, however, parents who are unaware that a child can fit through a pet door will not know to take the simple precaution of locking the pet door while the child is in the room in which it is installed. Though failure-to-warn cases are often brought as strict-liability claims, the manufacturer’s behavior—such as a conscious and knowing decision not to include warnings in the face of knowledge of dangers and injuries sustained as a result—will be considered in determining a manufacturer’s liability. Unlike most strict-liability actions, this form of strict-liability action allows negligence concepts to play an integral part. In a failure-to-warn case, although the behavior of the manufacturer is considered, manufacturers are assumed to have the knowledge of other manufacturers in the industry. Thus, if a danger such as child access through pet doors is known by members of the industry—or reasonably knowable thereby—the defendant-manufacturer will be deemed to have had knowledge of the danger of which it failed to warn. If your child has suffered a drowning or other injury after crawling outdoors through a pet door, you may be entitled to recover damages from those responsible. Contact child pet door accident lawyer Jeffrey Killino today at 877-875-2927 to learn more about your legal rights.